How do you define success? As part of the POPSUGAR Insights 2014 Healthy Living Report, we asked women to select the factors that they consider to be indicators of success today. 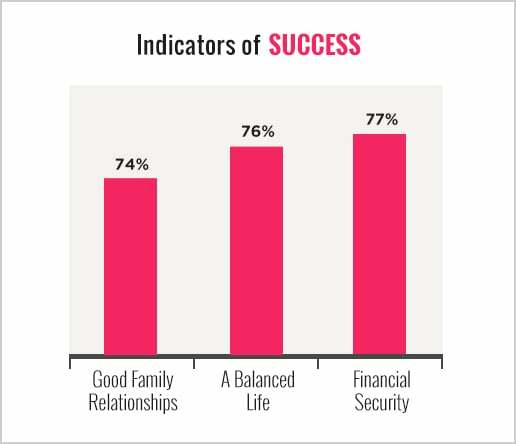 Women seek security and balance in life, and while 77% of women selected financial security as an indicator of success today, healthy living topics like having a balanced life (75%), having good relationships with family (74%), and being healthy (73%) rank highly for women. Work-life balance ranks highly in the top 10 responses, as being debt free (73%) and having a fulfilling career (72%) rank highly. Having good friends (71%), having a happy marriage (70%), pursuing passions (65%), and owning a home (54%) round out the top 10. Items like financial security and having a fulfilling career were highly prized by women between the ages of 25 and 29, but, perhaps ironically, so was finding balance. Women of this age are trying to have it all and are seeking support from media to help them find a way to achieve their personal and professional goals. Women between the ages of 18 and 40, especially those between the ages of 25 and 29, are facing challenges that prevent them from achieving their professional and financial goals while living a healthy lifestyle, finding balance, being healthy, and being a good friend and family member. Marketers can help by creating engaging, motivational, and informational content that provides these time-constrained women with the credible, fresh, and well-organized information they need to be successful.